Big-budget, highly-anticipated blockbusters have been known to occasionally create special advance teaser trailers to build buzz for their eventual release — often shot before principal photography of the film itself, and featuring footage not included in the final cut. Such was the case with Sam Raimi’s Spider-Man, which finally commenced principal photography in 2001 after years of false starts and aborted deals (including one that would have put James Cameron in the director’s chair). The Spider-Man teaser, which appeared in summer of 2001 (a full year before the film’s release) featured a bank robbery sequence not in the shooting script, in which the thieves escaped via helicopter — only to find themselves trapped in a giant web spun between the two towers of the World Trade Center. After the terrorist attacks of September 11th, Sony quickly pulled the teaser — not only from theaters, but reportedly from video copies of A Knight’s Tale, where it was included as part of the tape’s trailer package. 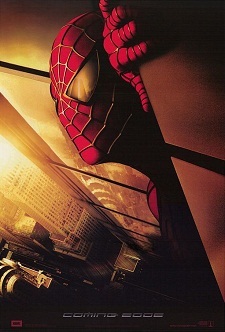 They also pulled the original teaser poster, which showed a WTC-heavy NYC skyline reflected in Spidey’s eyes.